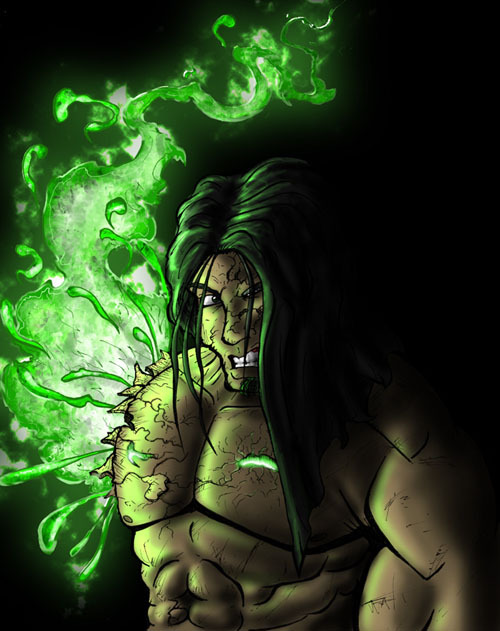 Alexius is an ancient Golem created thousands of years ago through the use of advanced magic weaving. His mind is whats known as The Kay Sphere. In essence, the Kay Sphere and Alexius are one and the same, Alexius was simply the name he was given over time which he prefered the most. This golem is different from most others, his completely sentient, with emotions and all. They are not QUITE as overwhelming as human emotions can be but hes got them. He was created to protect the civilization that created him, but to also be a companion to the people, and not just a mindless guard. He was not the only golem of his type created tho, his brother, known as Aeron was created for assault purposes, and intended for much larger scale battles. Aeron ended up becoming psychotic as his mind seemed to slip into battle raging. He almost killed Alexius before running away when a violent army of the Magi came upon Alexius home city. Which was wiped out by the Magi. Alexius then travelled the world in search of knowledge, he no longer wished for battle and picked up scolarly research for hundreds of years. Till he met a kind and amazing woman name Lilly. She was the only person who made him feel truely alive, untill Aeron found Alexius again, and killed Lilly and everyone else near her and Alexius. Alexius took up his place as a guardian again and made it his quest to find and destroy Aeron. Not simply for revenge, but to protect anyone else from Aeron's terrible brutality. The Kay Sphere is what creates Alexius's "skin". It takes nearby earthly minerals and turns them into a hard, flexible shell through the Kai energy the sphere produces. This energy feeds off of minerals and burns like fire, yet can shape the minerals and condence them together which makes Alexius's hard skin. If a hole is punched through him, Kai energy flows out, much like blood. Alexius can patch up the hole easily depending on the size of the wound. However it drains his Kai. If a limb is lost, it can be remade even in battle, though he can become very drained after. and the less Kai energy in him, the less strength he has. 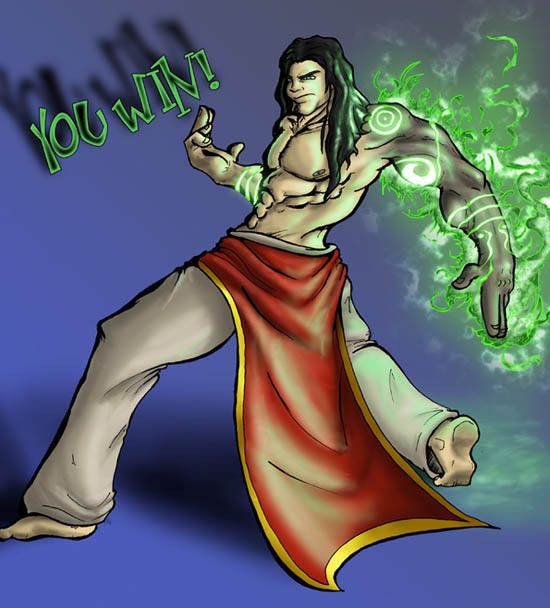 Alexius, after many years, learned to fight from shoulin monks. He has adopted his own style of fighting with his very mythodical and planned out. He will mostly defend and defend untill he sees a open point and will strike with palm thrusts. Everytime he makes an attack he counts. He doesn't play games in combat, and likes to get things done as quickly and as easily as possible, and prefers to stay away from violence, unless an innocent is in danger from the opposing force or if he has no real choice. Alexius's plam thrusts are different then most. On his hand he can quickly and easily (without using much Kai at all) open a hole from which he shoots concentrated Kai energy. Which he can make burn like fire, or push like a shock of air. Or do both. Alexius doesn't like his strikes going past 3. If a foe cannot be stopped in 3 strikes he moves to Level 2 Charge. Normally Alexius goes around the world uncharged, as in the flow of kai energy is normal. This allows him to fight just fine. But when needed, he goes to lvl 2, in which the kay sphere pumps out more kai into the body, filling it up. When in this level the kai energy is pushing on the skin so much that it shows, in the kai veins on Alexius which look like glowing tatoos of sorts. This give Alexius more power. but more importantly, he uses this to push more kai out of the body with each strike. Also this is when Alexius breaths Kai energy, somewhat like a fire breathing dragon. In this level Alexius becomes more reckless and a little less mythodical, the main attempt here it to stop the opponent quickly before the kai causes to much damage to his skin. But if Alexius cannot stop the opponent at all now. And ONLY when someones life is in danger or his direct life is in danger and he cannot stop the opponent in any other way. He will go to level 3. 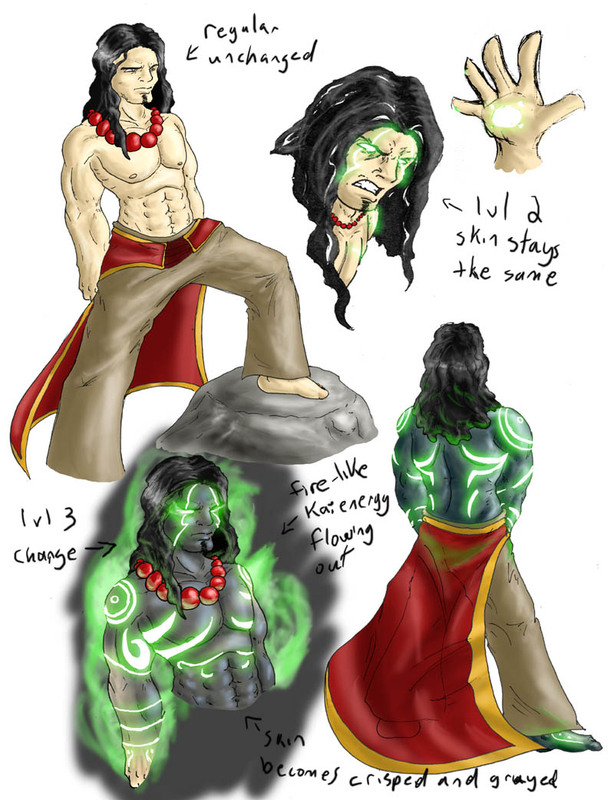 In Level 3, the kai veins open, and the kay sphere pumps out kai energy like wild and the energy flows around him, proecting him aswell as burning the skin on him and just about anyone who attacks him. In this level, Alexius doesn't defend, he assaults untill the foe is stopped. He doesn't attack with palm thrusts now but just fists, the kai energy causes more damage, and he can't expend more kai energy to the regualr thrusts. Aswell, Alexius will sometimes pump energy out through his feet to thrust himself quick in one direction. And if he kicks, will sometimes pump energy out of the kick much like the palms. However he doesn't often kick. He isn't very fast persay, thus why he relys on power and thought in his attacks. Waiting for openings before bothering to strike. Alexius is kind a caring, the only thing that he dislikes are people who willingly cause harm to others. Thats why he hunts Aeron. He is incredibly strong but not that fast. He isn't clunky tho, he is quite flexible, just not speedy. About everyweek or so he must rest aswell. In which he recycles the kai energy inside him and recycles his body. When he does this, he crouches down, and pretty much turns to stone.